We’ve talked about robots that are flying high, crawling around like bugs and worms, and sailing the seas chasing storms and sharks. 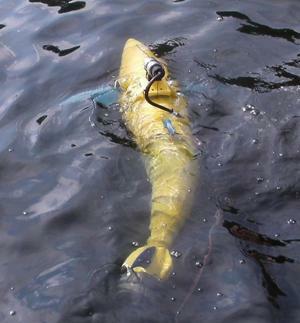 The robots that swim include underwater unmanned vehicles (UUVs), which are used primarily for inspection, data capture, and surveillance. The latest example is modeled after a tuna. The Department of Homeland Security’s Science and Technology Directorate has funded the development of the BIOSwimmer (Biomimetic In Oil Swimmer). This autonomous UUV is designed to resemble a tuna, because that fish is one of the fastest in the sea. Tunas have remarkably streamlined bodies, are highly maneuverable, and possess finely tuned muscular, sensory, and control systems. The BIOSwimmer is shown in the water during testing. The line is a camera tether. The robotic tuna has a flexible aft section and fins. Like many UUVs, it is battery-powered and designed for long-term operation. Also, its navigation, sensor processing, and communications are orchestrated by an onboard computer suite. The BIOSwimmer’s Operator Control Unit, which is meant to give users intuitive control and simple, mission-defined versatility, is laptop-based. According to its designers, the BIOSwimmer is unique in its internal components and external sensing mechanisms, which are built to function in high-viscosity fluids and highly constricted spaces. Its sensor payloads are interchangeable, and its operator controls can be reconfigured and optimized for a variety of specific tactical missions.